Edition #4 of our monthly Classic Material series pays tribute to the hip hop of 1990, a year when hip hop really spread its wings with a diverse range of new sounds breaking in all corners of the US and overseas. 1990 is probably most celebrated as being the birth of the ‘afro-centric’ era, with debut albums from X-Clan, Professor X, Poor Righteous Teachers, Tribe, Brand Nubian and many others hitting the stores during the year. But 1990 was also an important year for the artists from the opposite end of the spectrum: Compton’s Most Wanted, CPO and Above The Law all released debut albums proving LA had more to offer than just NWA. Aside from new developments, established artists including LL Cool J, Big Daddy Kane, Public Enemy and EPMD all dropped certified classics. The Classic Material Edition#4 party takes place at City Arts and Music Project, London on 19th February 2011 with special guest Mr Thing (Extended Players / BBE). You can also download bonus tracks originally featured on the Classic Material Edition #4 Mix CD. The CDs have long since sold out but you can now get the bonus tracks via Bandcamp. 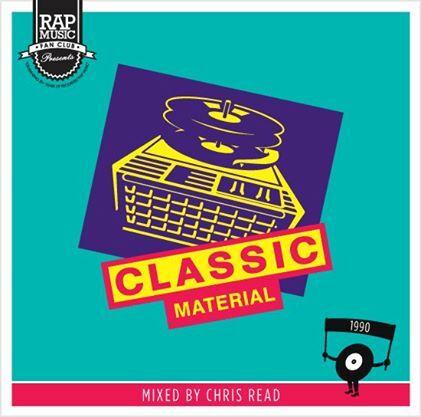 Featured tracks include a Chris Read remix of classics by Kool Chip & Chuck Chillout and Eric B & Rakim and a bonus megamix of popular cuts released in ’90.